Letters From A Tapehead: Insect Ark: "In The Nest"
Insect Ark: "In The Nest"
It was announced that Insect Ark, now functioning as a two-person collaboration between one-time sole insect Dana Schechter and drummer Ashley Spungin, will be releasing a new album in early 2018 titled Marrow Hymns. The lead single, "In The Nest," bakes and blisters as if charred by intense heat, its movement dramatic as if fighting against some external elements at odds with progress. Anticipation is high with this one. Marrow Hymns is scheduled to release 2.23.18 via Profound Lore Records. Music, links, and info were provided by Earplit PR. Combining elements of horror-ﬁlm soundtracks, psychedelic doom, and atmospheric noise, New York City/Portland-based instrumental duo INSECT ARK presents their newest record, Marrow Hymns, to be released on Profound Lore Records, February 23rd, 2018. Comprised of Dana Schechter (M. Gira's Angels Of Light, Wrekmeister Harmonies, Zeal & Ardor, Gnaw) and Ashley Spungin (Taurus, Purple Rhinestone Eagle, Negative Queen), INSECT ARK's intensely visual music weaves interludes of fragile beauty with crushing passages of swirling doom, spinning like a backwards fever dream. Marrow Hymns is a wordless song, a hypnotic voice that screams and whispers from a place deep in the furrows, from the bones, from the blood. Defying easy categorization, INSECT ARK's uncommon sound is in part the amalgamation of these two women's passions: Schechter's sinister bass lines and unconventional use of lap steel guitar (and her complete omission of electric guitar), and Spungin's lucid, exacting drumming and synth work with her own hand-built analog noise pedals (Ormus Electronics). Schechter describes INSECT ARK as being a voice when words fail to articulate emotions or experiences, a visceral form of communication through sonic submersion. 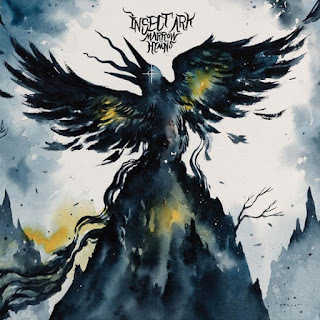 The cathartic nature of the music INSECT ARK creates is a document of life's many complex facets - perseverance and presence, chaos and meditation, birth and decay, brutality and delicacy, and of hope in the unknown. Marrow Hymns was recorded and mixed with engineer Ethan Donaldson at Mozart Street Studios in Brooklyn, New York over the course of eighteen months. With the two halves of INSECT ARK residing on opposite coasts, the album was largely skeletal in form upon commencement of recording. Overdubs and further writing/arrangements were done after Spungin's return to Portland in the isolation of Schechter's home studio. The sense of distance and vast emptiness remained intact in the songs, built out over many long nights. Marrow Hymns' song themes of displacement, loss, and isolation are personal journals of that time period, as both members found themselves simultaneously experiencing existential crises. However, the album also tells a story of strength and determination, made from the marrow of these two women, a song for all things that struggle to survive. Marrow Hymns will be available on CD, vinyl, and digital formats. Preorders to be unveiled in the coming weeks. In the meantime, sample the disquieting sounds of "In the Nest" at THIS LOCATION. Formed in 2011 by Schechter as a solo project, from its inception INSECT ARK has been about creating work that transports, both physically and psychologically. Spungin joined in 2015 for touring support of Portal/Well, and over the next year, INSECT ARK became something much greater than the sum of its parts. Both women have roots ﬁrmly in making work with no borders - they are DIY makers, multi-instrumentalists, gearheads, and visual artists. Spungin studies live sound, studio recording, programming, and analog electronics; Schechter composes music for ﬁlm and is a video maker/animator for ﬁlm/TV. A full-length video counterpart for live shows is to come shortly, integrating sound and visuals to build immersive sonic landscapes that echo in the empty spaces where the earth divides, offering the listener - and the band themselves - utter sensory submersion.